On 28 March 2018 we set a customised price-quality path applying new revenue limits and quality standards to Wellington Electricity for April 2018 to March 2021. Wellington Electricity owns and operates the electricity distribution network supplying 166,000 homes and businesses in the Wellington, Hutt Valley and Porirua regions. On 5 December 2017 Wellington Electricity submitted a CPP application to us as it no longer considered the default price-quality path met its needs. Wellington Electricity’s proposal is designed to ensure its network is better prepared to withstand and respond to a major earthquake by bringing emergency hardware, mobile substations, switchboards, critical emergency spares, and enhanced communication systems into the region, as well as strengthening substations. The application followed a Government Policy Statement issued in light of the 2016 Kaikoura earthquakes, which increased the risk of a major earthquake occurring in Wellington and highlighted the capital city’s vulnerability to seismic activity. The statement outlined the Government’s expectation that the Commission consider options to allow Wellington Electricity to recover resilience-related expenditure that was not anticipated when its price limits were set in 2014. Our final decision provides for the full $31.2 million of expenditure that Wellington Electricity proposed. We are satisfied that this expenditure is prudent and appropriate costed to deliver a more resilient network that is less susceptible to earthquake damage. 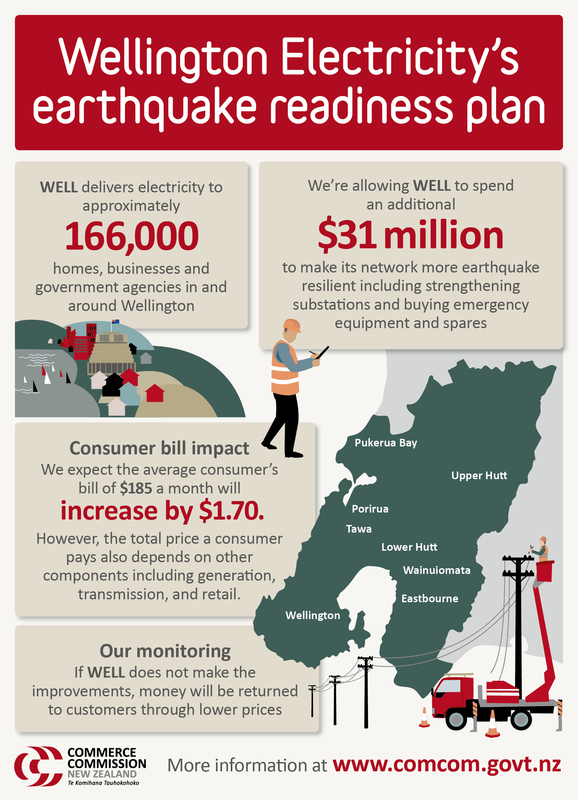 A key feature of the decision has been to set a resilience quality standard that incentivises Wellington Electricity to complete this urgent work. We expect the investment will result in a typical Wellington Electricity consumer’s monthly bill of $185 increasing by about $1.70 through to 2021. However, the total price a consumer pays also depends on other components including generation, transmission, and retail which make up the majority of a consumer’s electricity bill. This view shows the latest stage in the project. Click on the circled dates to see details. Navigate to other months, or scroll down, to see all stages. Note: these dates are indicative only and are subject to change.